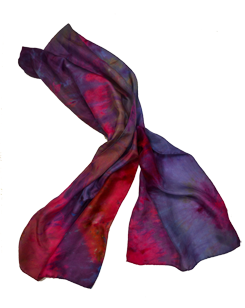 Gorgeous to the touch, these silk scarves are one-of-kind creations hand dyed using a variety of artistic methods. The colors take on their own unique pattern as pigments interact in unpredictable ways. Beauty is unearthed as the colors dance across the fabric in a harmonious image of display. Find them at the Eclectic Goat in Northfield. The colour of this scarve is mesmerizing.You can also get khmer traditional fashion from kambobiz.com at reasonable cost.